A fundamental question motivates these historically grounded reflections on sin: How can we talk about sin today? With a view to illuminating the answer, the following will reflect on certain conceptual dilemmas that came to define sixteenth-century Lutheran reflection on sin, and have punctuated it ever since. Our point of departure will be the Reformation’s radicalization of sin and its conceptual implications. In this light, we shall then consider how sin is disclosed. This will show the overarching dilemma in the relationship between law and gospel. When seen through the lens of sin, this relationship, I shall argue, appears to be more complex than the customary linear sequence in which the comfort of the gospel follows the accusation of the law and the conviction of sin. In fact, precisely this view leads to the loss of sin’s radical character, so crucial to Luther’s protest. The argument advanced here will be that, unless the gospel is related to the disclosure of sin, the Reformation’s insight about sin’s radicalness will be compromised, in the end minimizing not only sin but also grace. In the final section the essay addresses this very process by considering the impact which post-Reformation tensions, related to the nature of sin, exerted on the rise of autonomous human agency and being. Philip Melanchthon’s charge in the Apology of the Augsburg Confession (1531) is that “the scholastic teachers . . . trivialize original sin.”[i] This should give us pause. For it is hard to overlook the proliferation, in the late Middle Ages, of confessional manuals notorious for giving detailed instructions to priests on how to tease out admission of guilt from unwilling penitents. 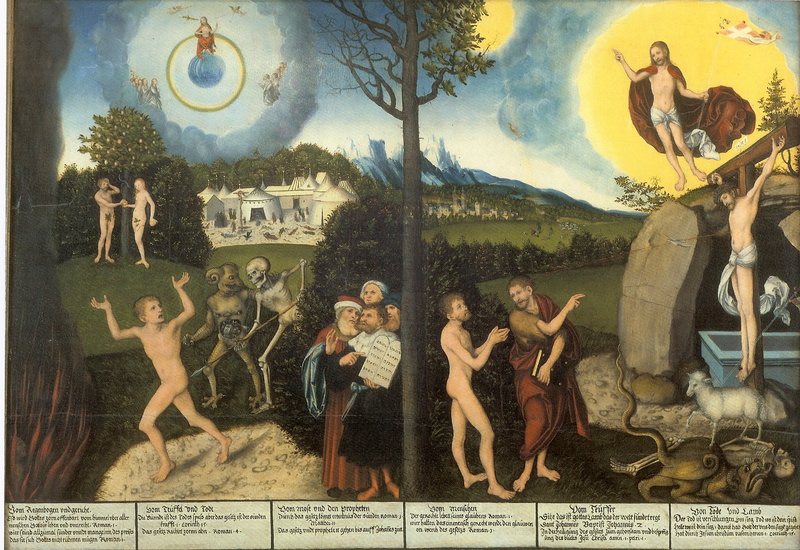 [ii] Nevertheless, as early as Luther’s Heidelberg Disputation (1518), there is a clear sense that there is more to sin. Sin is not just a transgression of the law, or a failure to keep it. Nobody in his right mind, including both Luther and his opponents, was interested in debating whether a crime was sinful. But Luther was vitally interested in debating whether, in addition to crimes, also those “works of man [which] always seem attractive and good . . . are nevertheless likely to be mortal sins.”[iii] Luther readily admitted that the works he had in mind were “not mortal sins . . . as though they were crimes [crimina].” But he still concluded that the good, attractive, even law-abiding works that humans perform could, in fact, be sins meriting eternal damnation. By contrast, today one rarely, if ever, hears Lutheran pastors speak to the good works of their congregants as likewise not immune to the danger of condemnation, perhaps even more in danger of it. After all, nobody wants to own their failures, but everyone wants to claim their successes. Today preaching sin seems to be confined largely to the law’s transgression. This brings us to the Reformation’s fundamental conceptual insight which, I think, ought to inform our consideration of sin today. It will not do simply to equate sins and crimes, sin and lawlessness, hamartiology and morality. But if we are not simply to equate them, how are we to relate them? Here two alternatives present themselves. The first option would be to regard crimes (crimina), as Luther understands them, merely as a subset of sin. Sin is simply a broader category: all crimes are sins, but not all sins are crimes. The larger set would then include also good works—those good works that are somehow deficient. With recourse to Kant, for example, we might blame this deficiency on the works being done only in accordance with duty, but not really out of duty. [vii] In that case, the opposite of sin would be virtue, wholehearted obedience to the law, which results not only in apparently or externally good works but in intentionally good works. Locating sin beyond ethical categories raises some dilemmas, two of which I discuss in what follows. In this section we ask whether a rational case can be made for sin. In the ensuing sections we consider sin’s relation to our humanity. To consider whether a rational case can be made for sin, we must begin with the question of how sin is disclosed. The Lutheran commitment to preaching the law rests on the assumption that sin can be rationally brought to light—even if the Formula of Concord adds the caveat that without the Holy Spirit’s alien, convicting work the chances are rather slim! [xv] However, in light of what has been said, it is not unreasonable to ask whether preaching the law can get at sin at all, with or without the Holy Spirit. But then why specifically preach the law? Can a jump be made from the knowledge of oneself as an occasional, or even habitual, law-breaker and impurely-motivated doer of the good to the knowledge of sin? Can a jump be made from an empirically established “tendency of man’s heart and nature,” as Jonathan Edwards would have it, to the knowledge of oneself as a sinner? [xvi] It seems the only way this can be done is by invoking some Anselmian assumption of debt that becomes infinite on account of the offended party: then a single offense, however slight in itself, makes one inescapably into a sinner. But even if we were to follow this route, is it at all commensurate with the insight that sin is, fundamentally, unbelief? In short then, what is it that we do when we preach the law? And in what sense does the illumination of legal failure prepare one for the gospel? Does the gospel play any role beyond being that for which the law prepares the way? These are some questions that, I believe, deserve more reflection than they customarily receive (Article V of the Formula of Concord notwithstanding). The “Lutheran” answers, it seems to me, cannot simply be taken for granted. [i] Ap II.7: The Book of Concord: The Confessions of the Evangelical Lutheran Church, ed. Robert Kolb and Timothy J. Wengert (Minneapolis: Fortress, 2000), 113 (hereafter, BC); Die Bekenntnisschriften der evangelisch-lutherischen Kirche (11th ed., Göttingen: Vandenhoeck & Ruprecht, 1992), 148 (hereafter, BSLK). [ii] To this end, some of the manuals contained elaborate hierarchies, for example, of sexual sins; see Thomas N. Tentler, Sin and Confession on the Eve of the Reformation (Princeton, NJ: Princeton University Press, 1977), 91, 141-2. For Luther’s reaction against excessive sexualization of sin, which obscures its true character, see his Lectures on Genesis (1535-45); in Luther’s Works, American Edition, 82 vols. (Philadelphia: Fortress and St. Louis: Concordia, 1955ff), 1:114 (hereafter, LW); D. Martin Luthers Werke, Kritische Gesamtausgabe, ed. J. F. K. Knaake et al., 57 vols. (Weimar: Böhlau, 1883ff), 42:86 (hereafter, WA). [iii] LW 31:39; WA 1:353. [iv] Luther writes in The Freedom of a Christian (1520): “Our faith in Christ does not free us from works but from false opinions concerning works, that is, from the foolish presumption that justification is acquired by works” (LW 31:372-3; WA 7:70). [v] Theses 41-46 (LW 31:12; WA 1:235). [vi] See the editorial footnote appended by the Kolb/Wengert edition of The Book of Concord to Art. IV of the Formula of Concord, Solid Declaration: BC 574, n. 139. [vii] Immanuel Kant, Groundwork of the Metaphysics of Morals, ed. Mary Gregor et al., rev. ed. (Cambridge: Cambridge University Press, 2012), 13. [viii] Eberhard Jüngel, “On Becoming Truly Human,” Theological Essays II, ed. J. B. Webster (Edinburgh: T&T Clark, 1994), 218. [ix] Rejected are also other views which tend to minimize the seriousness of sin, such as Peter Lombard’s teaching that “original sin is merely a reatus (obligation resulting from a debt incurred by someone else) without any corruption of our nature” (FC, Solid Declaration, I.17; BC 534-5; BSLK 850). [x] Smalc. Art., III.1.1 (BC 310; BSLK 433). [xi] LW 35:369; WA DB 7:7-8. [xii] LW 36:60; WA 6:529. [xiii] Søren Kierkegaard, The Sickness unto Death, ed. H. V. Hong and E. H. Hong (Princeton, NJ: Princeton University Press, 1980), 82 (emphasis added). [xv] FC, Solid Declaration, V.11 (BC 583; BSLK 955). [xvi]The Great Christian Doctrine of Original Sin Defended (1758; London: Johnson and Keith, 1766), 32 [Part I, Chapt. I, Sect. III]. This is an extremely important piece of work for pastoral ministry in our time. Thank you for writing it and sharing it.